Toddler water shoes are shoes your little one can wear in and out of the water. They give your toddler’s delicate feet the protection they need when he’s wading in a rocky stream, and they provide the traction necessary for a rollicking game of Marco Polo at the water park. When your toddler steps out of the water, the wetness drains out just as quickly as if he was wearing a sandal, and he’ll be able to run about on dry land quite as adroitly as he did in the water. In and out of the pool or creek all day, there’s no reason to change his footwear. For extended use out of the water—a toddler sized hiking expedition, say—and you’ll want to dry your toddler’s feet and have him put on a pair of socks under his water shoes to avoid blisters. Where to buy your child’s aqua shoes for toddlers? You have two options: online or at a traditional brick-and-mortar store. Online has the benefit of a wide selection, access to reviews from other parents, and, of course, the convenience of being able to do it all from your own computer. The brick-and-mortar store has the benefit of allowing you to see, touch, and feel the shoe before you buy it, and if you bring your child on the shopping expedition, you can even have him try it on. When you buy a water shoes for kids, you want something that will stay on, that offers reasonable traction, and that will be comfortable to wear—a nasty blister can spoil a vacation at the beach. A nice budget-friendly water shoe is iPlay’s Unisex Baby Swim Shoes. These are made of 82 % neoprene, 10% rubber, and 8 % nylon, and are breathable and comfortable in and out of the water. They may be a little hard to get on—there are no strings or straps to loosen to squeeze that little foot in—but once you’ve got it on it’ll stick. These shoes are available in aqua, royal blue, hot pink, green, black, and pink, so you should be able to find a color to please your little one or match with his or her swimsuit. 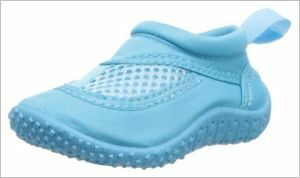 Another nice shoe is the Wave Children’s Aqua Shoe. 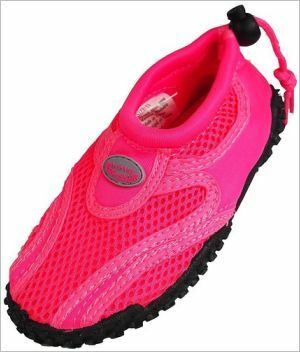 They are available in pink, grey, purple, royal, light purple, lime, orange, turquoise, fuchsia light pink, and white. The sole is rubber, the front panels neoprene mesh, and water will drain out of these shoes as easily as anything. The drawstring at the ankle helps it to fit securely, and your child should be able to run around anywhere wearing them. If one of the places he chooses is a muddy swamp, never fear: these shoes are also very easy to clean. The sizing runs a bit big, so choose your size conservatively. Whatever toddler water shoe you buy, it’s best to let him or her wear them for a few hours the first day, rather than doing a full-day adventure right off. During the first few wears check your toddler’s feet regularly for blisters; if you wait till she runs to tell you about it any blister or sore will be deep and slow to heal. If all is well those first trial times, you’ll have the peace of mind to let your child run in and out of the water like a wild thing all summer.